I’ve said it before, and I’ll say it again, I’m a soup girl! I make homemade soup once a week. Call me obsessed, go ahead, I won’t be offended…just make sure to be truthful and call yourself jealous at the same time. Soup is the quintessential one pot meal. Healthy, comforting, and delicious…every time. It’s also customizable and perfect for those with picky eaters in the house. Pack it with your favorite fresh veggies and lean proteins, fat free broth, herbs, and spices. Another underrated plus = minimal cleanup. 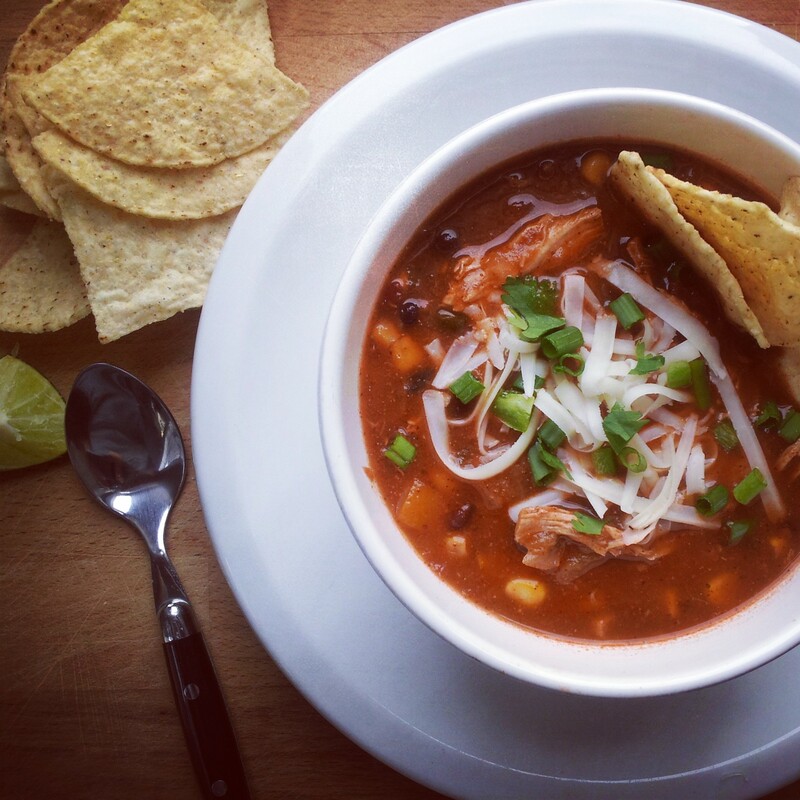 This recipe is hearty, spicy, and full of southwestern flavor. 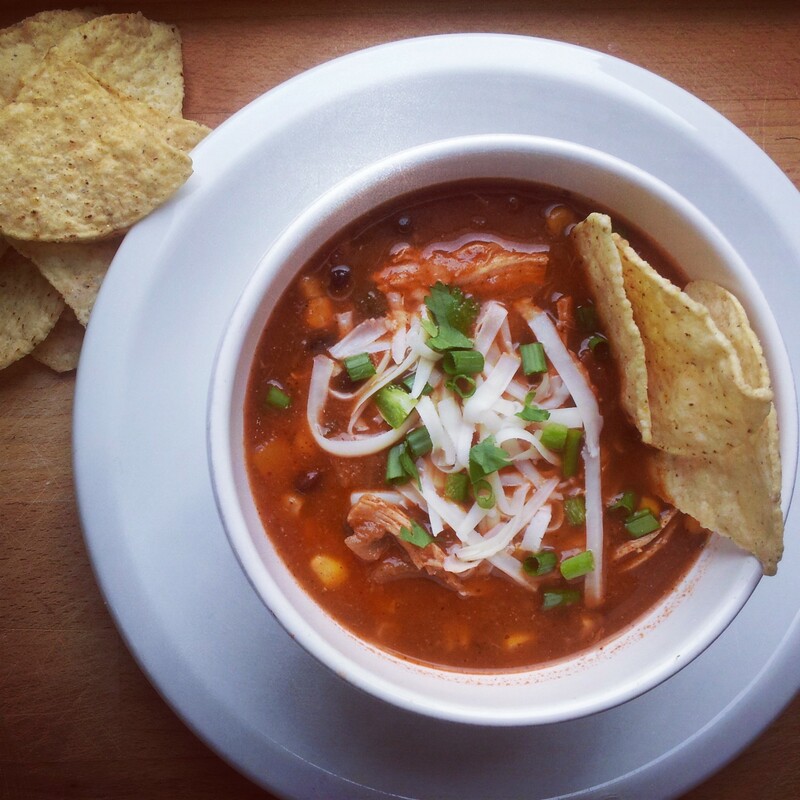 Plenty of typical chili flavors are prevalent, but this is lighter and “brothier.” Serve this addicting soup with lots of tortilla chips on the side for dunking and scooping. Oh yeah, don’t forget the cold Mexican beer with a lime wedge. This soup-obsessed girl gives this recipe her ringing endorsement! Heat olive oil in a large pot over medium heat. Add red onion, red bell pepper, and green bell pepper. Cook for 5-7 minutes until onions are translucent and peppers are cooked through. Add garlic and cook 1 additional minute. Add the rest of the ingredients to the pot (be sure to nestle raw chicken into the center of the pot). Allow soup to come to a light boil then reduce the heat to simmer, cover pot, and cook 1 hour. Remove chicken, allow to cool, and shred with 2 forks. Return shredded chicken to pot and cook for an addition 15 minutes. Adjust seasoning to taste (I sometimes add more lime juice or crushed red pepper flakes at this point). Can’t wait to make this with some homemade tortilla chips! You can’t beat homemade tortilla chips! Yum!! Enjoy. I make soup at least once a week too! Especially in the winter. It is so comforting. This Southwestern one looks soo delicious! Unfortunately I know my husband wouldn’t eat it (he doesn’t eat cumin, peppers, chili powder or chilies. :() — so I would have to make a half batch. I might be able to entice my son though — also a soup lover! I know it would be amazing with lime and chips! Make a half batch just for you…I promise, it won’t go to waste! !